Torosaurus was a herbivore (plant-eater) that lived in the late Cretaceous period, about 70 to 65 million years ago, and was one of the dinosaurs that died out in the Cretaceous-Tertiary extinction 65 million years ago. Torosaurus was upto 25 feet (7.7 meters) long and 7 feet (2 meters) tall, weighed around 4 tons, and in many ways resembled its more familiar relative, Triceratops. Torosaurus had one of the largest skulls of animal land animal known, reaching up to 8½ feet (2.6 meters) in length. 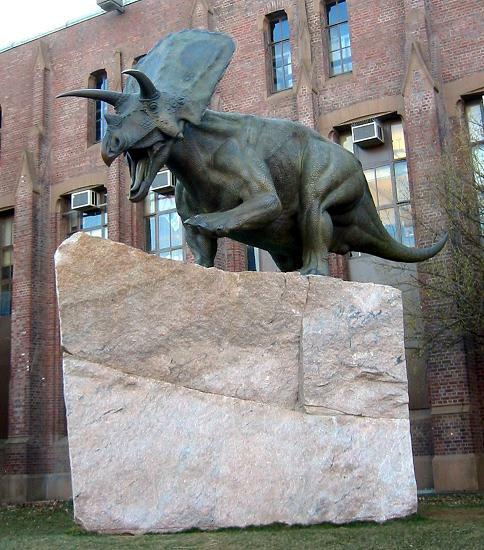 Torosaurus was named by the famous American fossil-hunter Othniel C. Marsh in 1891. Its name means "pierced lizard". Asian Dinosaurs - Torosaurus lived in North America and Asia. North American Dinosaurs - Torosaurus lived in North America and Asia. Torosaurus was a genus of dinosaur. "Torosaurus" means "pierced lizard". This name was chosen by Othniel C. Marsh in 1891. Torosaurus was a member of the Ornithischia ("bird-hipped") order of dinosaurs. What this means, is that although Torosaurus was not closely related to birds, it did have similarly shaped pelvic bones. Torosaurus was a Ceratopsian - a member of a group of related herbivorous (plant-eating) dinosaurs with beaks, many of which had neck frills and horns as well. Torosaurus lived between about 70 million years ago and 65 million years ago, during the late Cretaceous period. Torosaurus was one of the dinosaurs which died out during the Cretaceous-Tertiary mass extinction at the end of the Mesozoic Era. Torosaurus was a herbivore (plant-eater). Torosaurus was about 25 feet (7.7 meters) long, and about 7 feet (2 meters) tall. Torosaurus weighed about 4 tons. Boneheaded, duck-billed, and armored―what a display of dinosaur types! These animals lived in forests that are now the dry plains of Montana. Dig up facts about how these animals lived in prehistoric times. 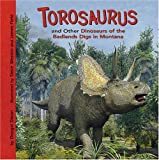 Triceratops: A History Just for Kids! Picture a rhinoceros grown to the size of a small semi-trailer truck--big, right! That's triceratops--one of the most fascinating dinosaurs you'll ever learn about. In this book, you'll learn all about what made this massive giant great--from what they looked like and ate to where they lived and what they did all day. KidCaps is an imprint of BookCaps; each month we are adding more history books (just for kids!) to our library. Stop by our website to learn more.